the quick power-repair kit for transporter and camper with twin-wheels * re-mobilize your vehicle within only 4 minutes * for transporter / camper-tyres with pressure up to 75 psi There is no simpler, faster and more effective way to repair a tyre puncture - and to continue your journey after only 4 minutes. There is no simpler, easier and more effective way to repair a tyre puncture - and to continue your journey after only 4 minutes. While tyre repair kits have been common for a while in passenger cars, they are starting to find more and more usage for transporters, campers and SUV. Daimler has equipped their transporter-model "Sprinter" and Volkswagen their transporter-modell "Crafter" with PREMIUM-SEAL for the first time as original equipment. Systems using a compressor are at a disadvantage: filling a transporter tyre can take up to 17 minutes. 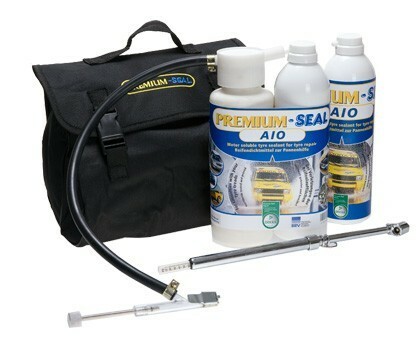 The new PREMIUM-SEAL AIO Comfort Plus System does the job in only 4 minutes. There is no simpler, faster and more effective way to repair a tyre puncture - and allow you to continue your journey after only 4 minutes. Using the valve insert remover (patents pending) a closed cycle between the tyre and the sealant bottle is created. The valve insert is protected from loss while removed from the valve. The aerosol can is directly connected to the sealant bottle. When pushing the button, the sealant is pumped into the tyre and an initial tyre pressure is established. A second aerosol bottle allows for the required minimum tyre pressure. The tyre pressure is further increased by the warming of the tyre while driving. The tyre sealant is newly developed and it prevents chemical reactions when used with aerosols. The construction of the aerosol can offers a safety margin that surpasses legal requirements. For vehicles with twin wheels a special valve insert remover has been defeloped, so that removing the outer twin-tyre is no longer necessary. With this tool both wheels are easily accessible for the repair. The PREMIUM-SEAL AIO Comfort Plus System is the ideal solution. Re-mobilized within only 4 minutes. For transporter/camper-tyres with pressure up to 75 psi. 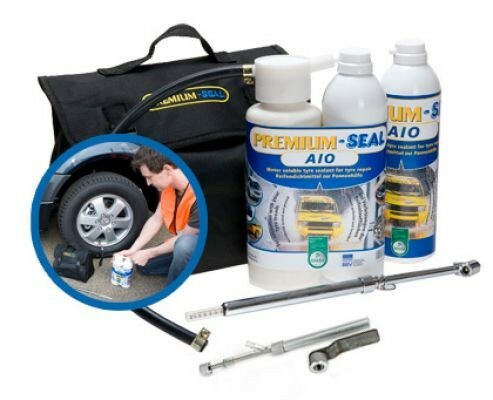 700 ml PREMIUM-SEAL Repair tyre sealant is sufficient for any common camper tyre. Seales punctures by objects with up to 10 mm. Temporary application only; maximum speed 50 mph. Shelf life minimum: 8 years. Water soluble. Tyre sealant can easily be removed from rims and tyres. Technically a punctured tyre can be repaired. The guidelines for repair of air tyres are applicable.